Not only did he photoshop the image and try and pass it off as the real deal (he only admitted it after being called out), he doesn't even credit the photographers after being found out. When I first saw this route I was inspired for the free solo I set up the achors and rope for abseil to get a closer look. On the decent I heared birds chirping from the hole Nonetheless I abseiled down. One section was slightly damp. I reached the bottom and pulled the rope. Before solo, my intuition said - the rock is slightly damp so take a carabiner and sling just in case. I wrapped the sling and carabiner around my chest and with chalk in hands started climbing. I was completely alone in that moment. At halfway the nesting birds started screeching and two big Jackal Buzzards flew out of the nest. One flew from the East and the other from the West. They were serious and going in for the kill. I was really afraid. I gripped the rock tightly. And knew I had to react quickly to survive. They were going for my eyes. I took the sling and carabiner off my chest, held onto the rock with one hand and swung the sling with the carabiner at the birds. I was shouting and swearing. It was a tense moment. The fight went on for about ten minutes The buzzard's eyes locked in on mine with intent to kill. They dive bombed me in succession. I swung hard and fast. Each time just missing. I swung again and came close to striking on one occasion. It was either going to be me or the birds. And I hadn't come so far to let these Jackal Buzzards kill me. I fought my heart out and eventually the birds realised I was serious too. They backed away and flew off. I wrapped the sling and carabiner around my chest. My heart was racing. I knew I had to stay focussed and climb to the top. I found my balance and climbed onwards anticipating the next attack. The buzzards were screeching from across the valley. But they did not return. I climbed on to the summit as quickly as I could. Yes. I made it. I'm alive! It was disrespectful of the birds to attack like that. I was far away from the nest. But one can't reason with agressive birds. And they were very aggressive. I do believe that respect for nature is essential. Now more than ever it's important that we restore a sustainable relationship with nature. And my work aims to motivate people to get outdoors and experience the wilderness responsibly. However there are always exceptions to the rule. In this case the situation was unforseable. A few more facts, the route is about 10 meters from the hole. And I was not intruding on the nest. The birds attacked without warning and were in for the kill. If I was stealing the eggs or young or trying to harm them then I would accept that I was wrong and agree with you. But in this case my response was correct. It was life or death on the edge and in that moment I protected my life, as you or any other person would have done. So Matt, please tell us is this what you advocate as ok behaviour when you take new climbers outside? Just curious. You admitted you knew they were there before you started to climb. Now any of us could have made the same mistake thinking they won't be disturbed, but instead of justifying your "f*ck the birds" attitude, if you had simply owned up to having made a mistake the world would have moved on. But you know, your followers have to know don't they? If you had kept quiet, no one would have known. Seriously, how dare those birds nest on a climbing route, or even be near a climbing route that Matt wanted to climb? Very very disrespectful. Last edited by KieranKP on Mon May 28, 2018 11:01 am, edited 1 time in total. Nice one Hendrik. I hope you're feeling better now. I don't know Matt other than a video I watched of him free-soloing an 8a in Montagu but hey, it's always nice to publicly humiliate people. Dude, if you're going to market yourself through social media and then use that to promote poor behaviour outdoors you're going to get called on it. If you then come clean and say you think you made a mistake this would all be forgotten in a moment. Instead he tried to justify his attitude so the only person who humiliated anyone was Matt when he posted that on Facebook in the first place. When you sell yourself as a bunny hugger, and someone who wants to get people to love the outdoors, then you have to set an example of good behaviour. Climbing too close to nesting birds, then attacking the birds and complaining about it afterwards is not that. Ag please just quit this post now. Its just rotten. Matt was clearly just caught up in the moment, maybe used the wrong words but hes more caring of nature than most of us. Seems like 'telling on' to me. Rather give the guy a call and chat to him than put it on a forum topic. You got to laugh at how the internet just loves picking up the old pitchfork. I had a good laugh at Matt's story. Come on. I went up that route a while back and I had no idea there was nesting birds. It's an easy thing to miss judge. And I'm sure Matt isn't out to pick a fight with mother nature. People must really chill out a bit. So if you go read my original post, I would like to think that if any of us got into this situation then when we post the story online we will add something along the lines of "I made a mistake, climbing within 10m of the nest and clearly disturbed the birds resulting in them attacking. In future I would consider giving them a wider berth". That is all he had to do, instead he put the blame on the birds. I for one would want to make newbies aware of our responsibility to be careful and respectful around animals/nesting birds. Matt has dealt with this very poorly, whatever he intended or meant is taken at face value. To quote someone from the UKClimbing forum "He really is a fountain of diarrhea". He is coaching kids, he's an impressionable person now - he is also a registered tourist guide. The way the whole thing reads out is very much the title of this post. 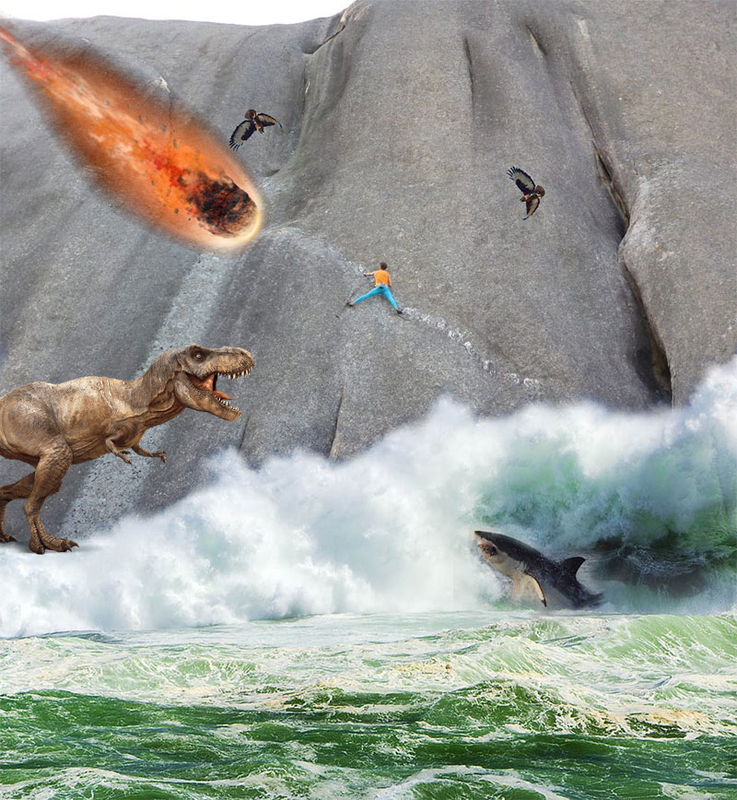 Martin Kocsis commented: "According to a post on UKC, you've stated somewhere on FB that this photo is in fact a photoshopped "reneactment" as you were alone when it happened. If you were honest, you would have stated that at the outset. If the birds were photoshopped in, it's reasonable to assume that nothing about this photo is true. Top rope? Possibly. You actually up there in the first place? Who knows. The truth of what happened? Let's all have a guess. You will always now be "that guy" who photoshopped a picture and then pretended it was real (until he got found out). Super awesome way to go dude." George Hawksworth commented: "Why was my comment calling you out on being irresponsible removed? The climbing community need to know how to act around wildlife and this post is sending the wrong message." An apology from Matt would have done wonders! FYI: Black Eagles are on the decline. -- A 'nature' conservationist or other concerned person alerts the 'people who work with Nature' to the above. They look at this circus and Matt's FB post regarding the birds (the nest and eggs/chicks). -- A consideration to close Paarl Rock to rock climbing is tabled (and possibly other areas). Why?? Because climbers don't respect nature and can't be trusted. 1. Believing that others will be impressed by his ability to survive the odds. (to be fair he gets a lot of publicity for doing exactly that). 2. Doing things that he knows he should not do. He knew that the birds were there, deep down he knew that he should climb elsewhere. However instead of doing that when the sh*t hit the fan he tried to justify it. Point 1. is understandable, point 2. is something that is common in the climbing community, especially the group that see themselves as Climbers. I could name list of things that I've and others climbers have done that we knew we should not, lets not go there. I would not be so worried about Matt being a bad example as I think he knew he was doing something questionable and would have given the correct advice to others. He has dedication and applies himself to what he does, it is important for children to be exposed to this. Last edited by mokganjetsi on Fri Jun 01, 2018 7:23 am, edited 1 time in total. Matt Bush is a f****g tool !!!! You have to do a bit more than climb close to a nest to make a real impact on the nesting habits of these birds. Anybody that have done environmental work on cliffs with raptors will tell you that you need more than just a quick passing visit in order to disturb them in the long run. In the Magaliesberg we were changing chicks in-and-out of nests for the sake of science and trying to improve the survival rate ... long story but they did not budge after numerous (respectful) visits to the nest and changing chicks etc. They kept going back to the same spot year after year! I think that in this Paarl Rocks case the act can be forgiven... it should be used as an example for anybody to learn from and we should avoid close encounters for more reasons than stated. BUT bad photoshopping as per the pic in this day and age ... UNFORGIVABLE !!! Where is the Like button!? People are too quick to jump on the hate train without actually bloody understanding why they are even doing it. Okay, lets play the relativism game first, in the greater scheme of things, Matt's altercation with the two Jackal buzzards is by no means the most deplorable or repugnant act committed against nature, and given the fact that he (Matt) was quite literally "fighting" for his life his self-defensive actions are quite understandable (and morally defensible). However, Matt's reaction to the commentary that ensued his post (which admittedly was most melodramatic) was less defensible. Matt simply refused to acknowledge that he (or anyone else) ought to have been more careful not to disturb the nesting birds (to preserve the well-being of both Matt and the birds) and just continued with his anthropomorphic demonization narrative of the birds. Moving swiftly along to the completely indefensible, Matt chose an edited (two buzzards were added circling the climber) photo to accompany his FB and Insta posts and failed to mention this fact, a clear misrepresentation of the truth and tarnishes his credibility. This is plainly just not cool. Lastly, for all those that believe the forum members or the south African climbing community is too hastily and inevitably prone to lynching, your confirmation biases are getting the better of you. Do yourselves a favour and visit Matt's FB/Insta/Climb.co.za posts and you will quickly realize the positive reactions far outweigh the negative. If you f#ck up you ought to face consequences, and, the more publicly you live your life (or a part thereof) the more publicized your f#ck ups and consequences thereof become. I think what Gustav said is good and well balanced. People get attacked by birds. Most of the time a nest could be involved but without being aware of such a nest climbers will climb and occasionally run into aggressive defensive birds. At that point most of us will just get away. Messing with endangered birds is a bad idea. We as climbers should be aware and avoid doing that. There are implications and consequences if we don't, even if you are one of those who doesn't care if they upset an endangered bird. Being attacked by birds is a bad idea. We should avoid that too. In as far as possible if one knows that there are birds nesting on a route and that you will upset them then logically do something else. If you are stubborn and go ahead anyway then please make sure that the birds aren't endangered due to the implications mentioned above. We as climbers choose to interact with nature. All of nature will continue to do its thing - the only thing we control is how we respond to it. Choose a better way wherever and whenever you can. But the guy can climb! Last edited by tygereye on Wed May 30, 2018 4:53 pm, edited 2 times in total. You have to admit that climbing pic of the year is going to be the one with the shark in it... the birds pale into insignificance compared to endangered sharks..
Fun fact. A quick check of the jackel buzzard's place on the IUCN red list shows that it is classified on the lowest tier under Least Concern, along with humans. So in fairness these were two endangered organsims battling for the survival of their species. Naw, I feel it needs more drama to make it believable!! There I was thinking Alien Spaceship...but what the hey! We all do stupid things, but the age of the internet has made our mistakes far more public. Ok, admittedly he shouldn't have posted this in the way he did - something like "I climbed [route name] last week and didn't notice some birds nesting nearby. I guess I got too close and they felt intimidated, so they attacked me and I was forced to fight them off with a sling and draw I happened to be carrying. Scary indeed - but an important lesson learned, always look out for nesting birds before starting a climb. Here's a photoshopped recreation of how it felt." Funny that people start questioning everything someone did as soon as they make a mistake like this. I seriously doubt that he has been faking/photoshopping climbing photos and videos for years without anyone noticing (including his photographers/film crews). Last edited by Ghaznavid on Fri Jun 01, 2018 8:37 am, edited 2 times in total.